1867. 10 ton duplex hammer. 1866 Death of his daughter Margaret Holt. April 1862 - 1871 Locomotive Superintendent, London and North Western Railway, Crewe - Grand Junction Railway. Described by the engineer Charles T. Porter in the American Machinist as 'one of the originating minds to whom the world is indebted for everything'. JOHN RAMSBOTTOM was born at Todmorden on 11th September 1814, his father being a small cotton-spinner, who owned the first steam-driven mill in the valley. Here his education was that of a remote village, where after a short time spent in a dame's school he went to four schoolmasters in succession, then to a Baptist minister, and finally to a colleague of the latter, who taught him as far as simple equations, leaving him to show afterwards, like many other self-educated men, that the true university was his own mind and power of thought. His father having given him a 6-inch lathe, rigged up in the warehouse, he constructed various models of steam-engines, including a beam engine with condenser, an oscillating engine, Hero's reaction engine, a water-raising engine, and a small locomotive engine to run upon a table or upon the floor. Later he made a stationary "table" engine, with upright 5-inch cylinder and 18-inch stroke, and an overhead cross-head with side-rods down to a crank shaft underneath the table; it was worked with steam of the then high pressure of 50 lbs. per square inch, of which the villagers took notice that it looked rather blue as it escaped from the safety valve. For a friend who was a confectioner he made an engine with 4-inch cylinder and 12-inch stroke. 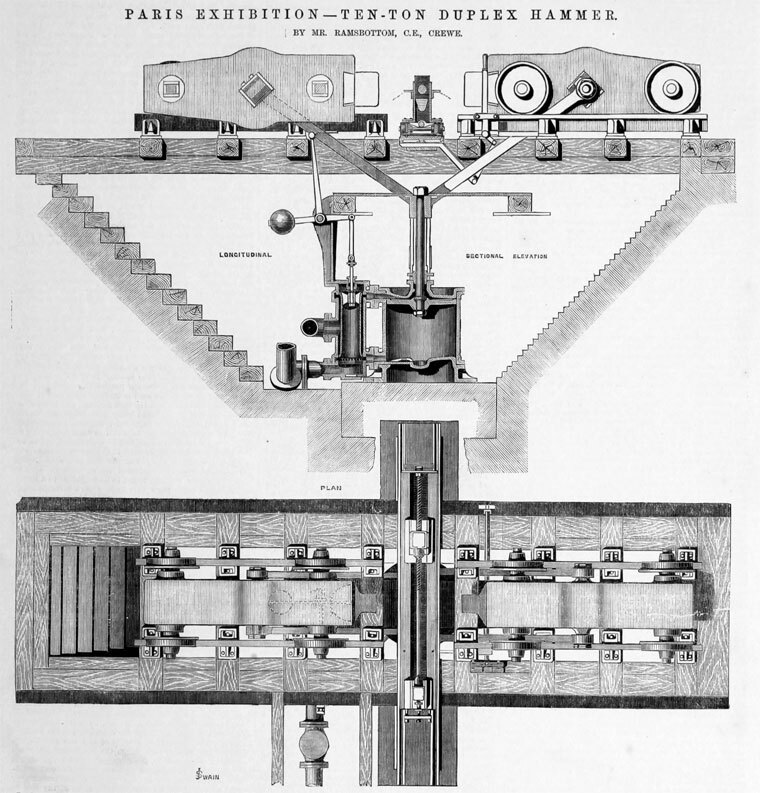 Of more importance was his reconstruction and erection of the engine in his father's mill, including a larger cylinder of 18 inches diameter and 4 feet stroke, a new beam, connecting-rod, air-pump, and condenser, the last two being purchased from Messrs. Peel, Williams, and Peel, Soho Iron Works, Manchester; he also designed and fitted up new side pipes with slide-valves, and a new parallel-motion. He carried out the lighting of the mill with coal gas, which at that time was the new illuminant. He also schemed, made, and successfully worked an automatic machine for the manufacture of cut nails. Probably the most notable invention of those first twenty-five years of his life, spent at Todmorden, was the weft fork or weft stopper, now universally adopted, without which it would be impossible to work looms at a high speed. He was active and enthusiastic in the interests of the first Mechanics' Institution at Todmorden, possessing quick literary perception and an appreciation of whatever was graceful and intellectual. About 1839 he went to Manchester, and entered the service of Messrs. Sharp, Roberts and Co., who already enjoyed a high reputation as makers of locomotive engines and of cotton-spinning machinery. Thanks to the practical experience he had acquired at home, he at once obtained employment and pay, without preliminary apprenticeship; and here he first gained practical knowledge of the design and construction of locomotives. His enthusiasm, industry, and ability speedily attracted the attention of Mr. Charles F. Beyer, the head of the locomotive department of the works, who had himself worked his way up to that position by the energetic exercise of the same qualities. After three years' service he was appointed in 1842 on Mr. Beyer's recommendation to be locomotive superintendent of the Manchester and Birmingham Railway; the locomotive sheds were at Longsight, where he had under his charge a number of engines constructed by Sharp, Roberts and Co., and by Robert Stephenson and Co. In 1846 several lines previously independent were united to form what was thenceforth known as the London and North Western Railway, on which his appointment became that of district superintendent of the north eastern division. On 1st August 1857 he was promoted to take charge as locomotive superintendent of the northern division at Crewe Works, in succession to Mr. Francis Trevithick; this division then comprised all lines north of Rugby, including the Trent Valley from Rugby to Stafford, as well as the old route northwards via Coventry, Birmingham, and Wolverhampton. In 1858 he turned out a number of new goods engines, having inside frames and inside bearings only, with inside cylinders 17 inches diameter and 24 inches stroke, and six coupled wheels of 5 feet diameter; many of these are still at work after nearly forty years' service, and they remain the standard. In November 1859 he completed and placed in daily traffic the first of his class of express engines, which he named the "Problem," afterwards changing the designation of the class to the "Lady of the Lake." These engines he continued to build till July 1865: they had cylinders 16 inches diameter and 24 inches stroke, and driving wheels 7 ft. 7.5 ins. diameter; the engine weighed 27 tons in working order, and the tender 17.5 tons, making 44.5 tons total. The "Problem" was the first engine in this country to be fitted with the Giffard injector. Altogether sixty of these single engines were built, all of which are still at work and appear to have many more years' life yet before them. Previously to 1863 all passenger engines had been single, while all coupled engines had been reserved for goods traffic; but in that year the weight of some of the fast main-line trains led him to take the novel step of introducing express passenger engines having four wheels coupled. Several of these were built, in addition to thirty small shunting engines on only four wheels, which were coupled. In 1862 it was decided to concentrate the whole of the locomotive work at Crewe, and to use the former locomotive shops at Wolverton for carriage building. Being confirmed in the control of the Crewe Works, he was now able to give full scope to his mechanical ability and ingenuity. Paying the greatest attention to facilities for the economical manufacture and maintenance of engines, he reduced the number of classes to the utmost, and their parts to as great a degree of uniformity as possible, thereby enabling repairs to be speedily executed. The system of working to standard gauges was also carried out, whereby not only were new parts made accurately to standard dimensions, but also a series of graduated sizes was adopted for renewing worn details. Special tools were largely introduced throughout the works; and particular attention was paid to the convenient handling of the work, and to its transference from one department to another. The improvements he effected for the latter purposes included the extensive introduction of traversing cranes driven by high-speed cotton ropes, and the narrow railway of 18 inches gauge, which ramifies everywhere through the premises, and performs such useful work. Under his direction were introduced at Crewe the Bessemer and open-hearth processes of steel manufacture; and in this connection he originated several notable deviations from what had till then been the ordinary practice: namely, a powerful togging mill, made of segments of rolls of large diameter, which proved highly effectual for putting the first heavy work into the Bessemer ingots; a horizontal duplex steam-hammer, having two hammer-blocks running horizontally upon rails and propelled against each other by a horizontal steam cylinder behind each; and a plan of reversing a train of rolls by reversing the engine itself, which is comparatively quick-running, instead of by the cumbersome and destructive clutch-arrangement then in vogue in connection with a slow continuously running engine having a heavy fly-wheel. The reversing of the engine was effected by steam or hydraulic power, readily controlled by a lad; and the draft of the rolls themselves was similarly controlled, the adjusting screws in the housings being geared together so as to ensure absolute parallelism. Among the most important of his numerous efforts to improve the construction and working of locomotives were the steps he early took for adopting the use of coal instead of coke, his arrangement of air admission. for the prevention of smoke being entirely effective; the displacement lubricator, which was the forerunner of "sight feed" lubricators in general; light piston with simple packing-rings exerting equal pressure all round; an improved form of the double-beat regulator; duplex safety-valves, which could not be tampered with; telescopic boiler; solid coupling-rod ends; weldless steel tires forged and rolled from conical ingots; portable appliances for re-boring cylinders and planing up valve-faces of locomotives is siti, which he schemed and introduced in the early days at Longsight; and the plan by which he is perhaps best known to the public, for enabling locomotives while running to pick up water from a trough laid on the permanent way. He was one of the original Members who joined in constituting this Institution at its establishment on 27th January 1847; and was for seven years a Member of Council, for thirteen years a Vice-President, and President in 1870 and 1871. During that period he contributed no less than thirteen papers upon his inventions. As early as 1849 he gave a description of an improved locomotive boiler, in which he sought to obtain by means of a separate steam-chamber a larger flue area and larger heating surface, with less relative bulk and weight, and with great simplicity of construction. In 1853 he described an improved coking crane for supplying locomotive engines; in 1854 the light and simple piston for steam engines, and in 1855 the construction of the simple packing rings so shaped as to exert equal pressure all round the cylinder. Then followed in 1856 the duplex safety-valves which cannot be tampered with; and in 1857 a description of Mr. William Routledge's safety escape-pipe for steam boilers. In January 1861 he described the method of supplying water to locomotive tenders whilst running, the first water trough having recently been laid on the Chester and Holyhead line near Conway, where it had successfully stood the test of the severe winter 1860-61. The general adoption of the plan on all main lines is the best testimony to its value; without it the long runs now made by express trains would be impossible. In 1864 he described the traversing cranes at Crewe; in 1866 the reversing rolling mill; and in the same year the manufacture of weldless steel tires, by forging from a conical ingot, giving a plain bevelled edge to the bloom by hammering on a beck iron, and finally rolling in the circular rolling mill invented by Mr. Peter Bothwell Jackson. When in March 1870 the endless-rope haulage of trains through the Edgehill passenger tunnel at Liverpool was abandoned in favour of ordinary locomotive traction, he devised and successfully carried out the mechanical ventilation of the tunnel by means of an exhausting fan, of which he gave a description in two papers during his presidency in 1871. Failing health compelling him to relinquish such active work and such weighty responsibilities as he had borne for fourteen years at Crewe, he retired in September 1871 from his position there, after having been nearly thirty years in the service of the railway. While at Crewe he took an active interest in the local Mechanics' Institution, of which he was President; and after leaving he founded in 1873 at the Owens College, Manchester, the Ramsbottom scholarship of £40 per annum, tenable for two years, to be competed for by young men employed in the locomotive department of the London and North Western Railway. In 1883, having in the interval happily succeeded in recruiting his health, he became connected with the Lancashire and Yorkshire Railway, and acted as their consulting engineer for the design and construction of their works at Horwich; and in 1885 he was elected a director of the railway, which position he only recently resigned. He was also a director of Messrs. Beyer, Peacock and Co.'s works. He was a governor of the Owens College, and a generous contributor to the fund for building a medical school in connection therewith. He was also an old Member of the Manchester Literary and Philosophical Society; and was elected a Member of the Institution of Civil Engineers in 1866. In 1888 the honorary degree of "Master in Engineering " was conferred upon him by the University of Dublin as a Past-President of this Institution, upon the occasion of the Summer Meeting of the Institution being held for the second time in the capital of Ireland; this is the highest engineering degree, and had been conferred honoris causca in only six previous instances. His last appearance among the Members of the Institution was as a guest at the dinner at the Manchester Meeting on 1st August 1894, when he proposed the toast of "The Owens College." His death took place at his residence, Fernhill, Alderley Edge, on 20th May 1897, in his eighty-third year, after some months of illness patiently borne. JOHN RAMSBOTTOM was born on the 11th September, 1814, at Todmorden (on the Lancashire side of the border), where his father, a small cotton-spinner, owned the first steam-driven mill in the valley. Beyond a little schooling in his native town, and the opportunities which the neighbourhood afforded of noting and to some extent practising the various handicrafts as then carried on, he was an entirely self-educated man, and it was due solely to energy and perseverance that he rose to the front rank of the profession as an eminent locomotive engineer. The first twenty-five years of his life were spent in Todmorden, where he took a very active interest in all kinds of mechanical and scientific pursuits. He had a small workshop in one of the rooms of his father’s house, where he experimented in many directions, and produced a number of interesting working models, amongst them being a model of a condensing beam-engine and a quaint model locomotive. He also carried out such works as the rebuilding of his father’s mill-engine, and a complete installation of the then new illuminant, gas, in the mill. At that time he schemed, made, and successfully worked an automatic nail-cutting machine ; but, probably, the most noteworthy result of this period was his invention of the now universal weft-fork or weft-stopper, so well known throughout the textile manufactures as an indispensable adjunct to the power-loom. Mr. Ramsbottom went to Manchester about the year 1839 and entered the service of Sharp, Roberts and Co (afterwards Messrs. Sharp Stewart and Co.), where he at once obtained journeyman’s employment and pay, without any preliminary apprenticeship, and first gained practical knowledge of the design and construction of locomotives. He rapidly became a most efficient workman, and his ability and energy attracted the attention of Charles Frederick Beyer, who was then in charge of the locomotive department of the firm. After three years in the service of Messrs. Sharp, Roberts & Co., Mr. Ramsbottom, on the recommendation of Mr. Beyer, was appointed, in 1842, locomotive superintendent of the Manchester and Birmingham Railway, which in 1846 was amalgamated with the London and North Western. He remained for fifteen years in charge of the works at Longsight, and on the retirement of Francis Trevithick in 1857, was transferred to Crewe as Locomotive Engineer for the Northern Division, with which was amalgamated the North-eastern, his old division. In the following year he turned out several new goods engines, which, with larger boilers, are still at work. In 1859 he designed and constructed his first express engine, the 'Problem,' No. 184, which was the first of the well-known 'Lady of the Lake' type. So efficient was the work he turned out that, after thirty years, locomotives of the 'Lady of the Lake' class were used for light loads at high speed, between Euston and Crewe, in the race to Scotland of 1888. In 1862 the Directors of the North Western decided to centralize the locomotive work at Crewe and to utilize the Wolverton shops for carriage building. In the re-organization of the Crewe works Mr. Ramsbottom had full scope for his mechanical ability. He paid the greatest attention to facilities for the economical manufacture and maintenance of engines. He recognised to the full the advantages of reducing the number of types to a minimum and to as great a degree of uniformity as possible, not merely in respect of a thorough interchangeability of parts in engines of the same class, but to a great extent throughout the different classes, and he carried out the system of working to standard gauges to an extent which was then quite new in railway practice. Not only were new parts made accurately to standard dimensions, but a series of graduated sizes was adopted for the renewal of worn details. Special tools also were freely introduced at Crewe, and particular attention was paid to the convenient handling of work and to its transport from one department to another. Among the improvements he effected was the extensive introduction of cranes driven by high-speed cotton-ropes particularly of the Ramsbottom single-rail crane and the development of the 18-inch gauge railway system which performs such useful work at Crewe. At an early period of his career at Crewe he recommended the Company to adopt the manufacture of Bessemer steel; and the steelworks at Crewe, which were erected under his auspices, were among the first to be established in the country away from Sheffield. 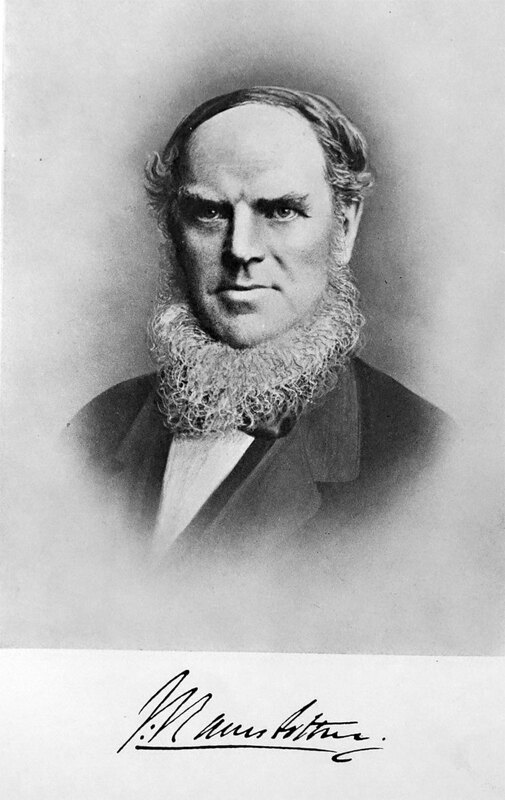 Some idea of the manner in which Mr. Ramsbottom turned his experience and ingenuity to practical account may be gathered from reference to the numerous Papers he contributed to the Institution of Mechanical Engineers, of which he was one of the originators and President in 1870 and 1871. So far back as 1849 appeared a description of an improved locomotive boiler, in which he sought to obtain a larger area of flue-room and large heating surface with less weight. Six years later he published an account of an improved coking crane for supplying locomotives, and this was followed by particulars of the piston-ring, with which his name is associated, and of the construction of packing-rings for pistons. Then came descriptions of an improved safety-valve and a safety escape-pipe for steam-boilers. Perhaps the invention which caused him to be most widely known was the trough laid in the track to supply water to locomotives while running. This apparatus, which was first adopted on the North Western system, is of great value in enabling traffic to be worked without delay for taking in water, and without it the long runs now made by express trains would be impossible. In addition to the high-speed cranes already referred to, he introduced at Crewe an improved reversing rolling-mill and a new system of manufacturing steel tires, the latter suggested to him by F. W. Webb. When in 1871 the endless-rope traction through the Edgehill passenger tunnel at Liverpool was done away with, and the tunnel was worked by locomotives in the ordinary way, he devised and successfully carried out a system of ventilation by mechanical means. In 1871 Mr. Ramsbottom was compelled by failing health to retire from active work. Subsequently, however, in 1883, he became connected with the Lancashire and Yorkshire Railway Company, acting as their consulting engineer in the design and construction of the works at Horwich. He was elected a director of the Company in 1885, on the death of Lord Houghton, and only recently resigned. 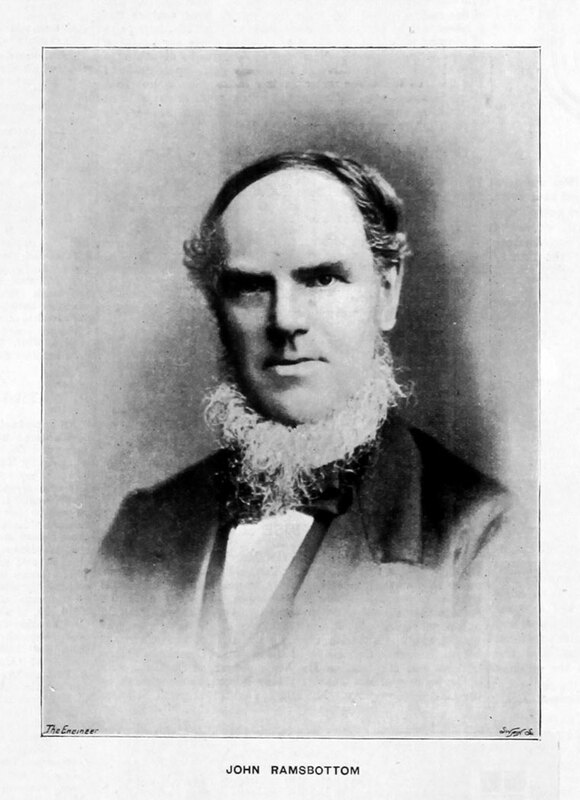 He was also a director of Beyer, Peacock and Co.
Mr. Ramsbottom, during the period of his connection with Crewe, took an active interest in the Mechanics' Institution, of which he was President. In 1873 he founded the Ramsbottom Scholarship for mechanical engineering at Owens College, Manchester. The Scholarship is available for two years, the income being £40 per annum, and may be competed for by young men employed in the Locomotive Department of the North Western Railway Company. Some years ago the honorary degree of Master of Engineering was conferred upon him by the University of Dublin. Mr. Ramsbottom died at his residence, Fernhill, Alderley Edge, Cheshire, on the 20th May, 1897, in his eighty-third year. He was elected a Member on the 10th April, 1866. JOHN RAMSBOTTOM died at Alderley Edge, Cheshire, on May 21, 1897, at the age of eighty-three. He was one of the best known and ablest men connected with the early history of locomotive, general mechanical, and metallurgical engineering during the present century. He was for many years chief mechanical engineer of the London and North-Western Railway, and was succeeded in that position by Mr. F. W. Webb. He took the lead in the laying out of the railway town of Crewe and the extensive works there. Under his direction the Bessemer and open-hearth processes of steel manufacture were adopted at Crewe. He was also the originator of the Ramsbottom system of rail and togging mills. He did much to advance the practice of engineering generally, but especially in reference to locomotive and fixed engines, and he also invented the system of taking up water by locomotives running at full speed. He retired from the service of the London and North-Western Railway in 1871 on account of ill-health, but afterwards took an active part in the management of the Lancashire and Yorkshire Railway, of which, on the death of Lord Houghton, he was elected a director. He was for many years a prominent member of the Institution of Mechanical Engineers, of which he was President in 1870. He received the degree of Master of Engineering from Dublin University, and was a governor of Owens College, Manchester. He was also a member of the Institution of Civil Engineers, and an original member of the Iron and Steel Institute, and was elected Vice-President at the first general meeting of the members on February 25, 1869. "As we briefly announced last week, Mr. John Ramsbottom died at his residence, Fernhill, Alderley, Edge, Cheshire, on the 20th ult., in his 83rd year, with a full record of good work, and to the regret of a wide circle of friends. He was born on September 11, 1814, at Todmorden, in Yorkshire, and started his engineering education under his father, while subsequently he was engaged with Messrs. Sharp, Roberts, and Co., Manchester, where he first became associated with the design and building of locomotives. In 1842 he entered the service of a railway which subsequently became part of the London and North - Western system - the Manchester and Birmingham line, with workshops at Longsight, where Ramsbottom was engaged for 15 years. In 1846 the line was taken over by the London and North-Western Company, but Mr. Ramsbottom continued as locomotive superintendent of their northern and north-eastern sections, and in 1857 succeeded Trevithick at Crewe. At that date the London and North-Western Railway Company had two important locomotive works, namely, at Crewe and Wolverton, belonging to the northern and southern divisions respectively; but five years later the centralisation of the locomotive ·work at Crewe was carried out, the W olverton shops being utilised for carriage building. With the adoption of Crewe as the chief locomotive centre commenced the wonderful development of these works, which has continued ever since, and which has made Crewe the object of pilgrimages by railway engineers from all parts of the world. "WIDESPREAD regret has been experienced at the death, on the 20th inst. , of Mr. John Ramsbottom, who did so much towards the evolution of the modern locomotive. Indeed, he has closely identified with many branches of engineering, and we defer our extended notice of his career until next week owing to pressure on our space to-day. He was in his eighty-fourth year, having been born at Todmorden in Yorkshire, on September 11, 1814. He was with the locomotive engineering firm of Messrs. Sharp, Roberts and Co. before he entered the service of the Manchester and Birmingham, now the London and North-Western Railway, afterwards succeeding Mr. Trevithick at Crewe, and continuing with that company until failing health compelled him to relinquish some of his labours in 1871. He was one of the originators of the Institution of Mechanical Engineers in 1847, was elected to the Council In 1849, becoming a vice president in 1854, and finally was President in 1870 and 1871. During this period he was specially active as an inventor, and the Institution were fortunate In securing from him a long series of valuable contributions relating to the improvements he introduced. These matters, however, we must leave to be dealt with next week." This page was last edited on 12 February 2019, at 17:16.